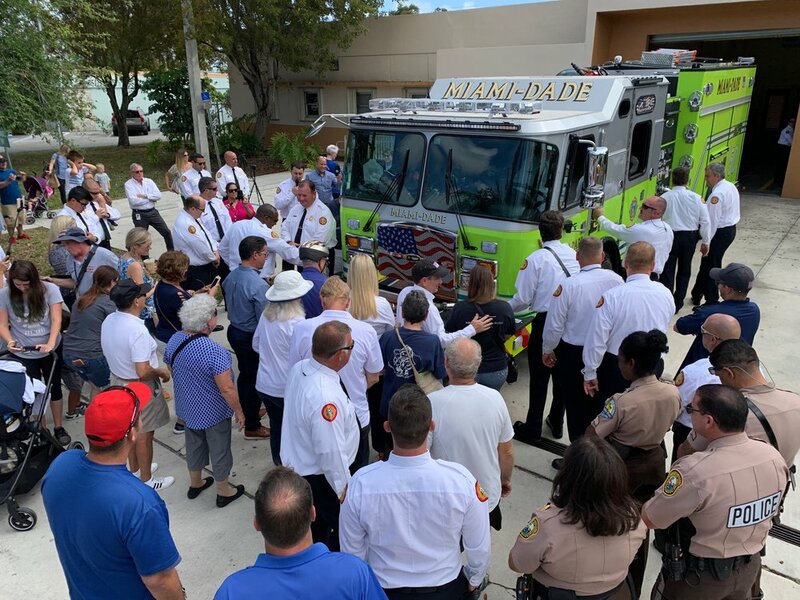 Today alone, Miami-Dade Fire Rescue brought three new engines into service and added 49 firefighters to the County. In Palmetto Bay, it was Engine 50 that arrived. As is tradition, from the days when fire engines were pulled by horses and could not be backed into the fire station, the community held a Push-In Ceremony where everyone on hand literally lent a hand by pushing the engine into the garage for the first time. Fire Chief Dave Downey introduced Mayor Karyn Cunningham who was joined by Councilmembers Fiore and Matson. The Mayor thanked Miami-Dade Mayor Carlos Gimenez and County Commissioners (including District 8's Daniella Levine Cava, who also attended) for approving the budget that allowed Palmetto Bay to receive the state-of-the-art engine. Mayor Cunningham thanked the Station 50 firefighters themselves by presenting them with a key to the city. The engine will provide additional 24/7 protection to Palmetto Bay residents.